For those new to this series, I have decided to keep you all in the loop with these monthly updates so that they live forever somewhere rather than solely in my monthly newsletters. 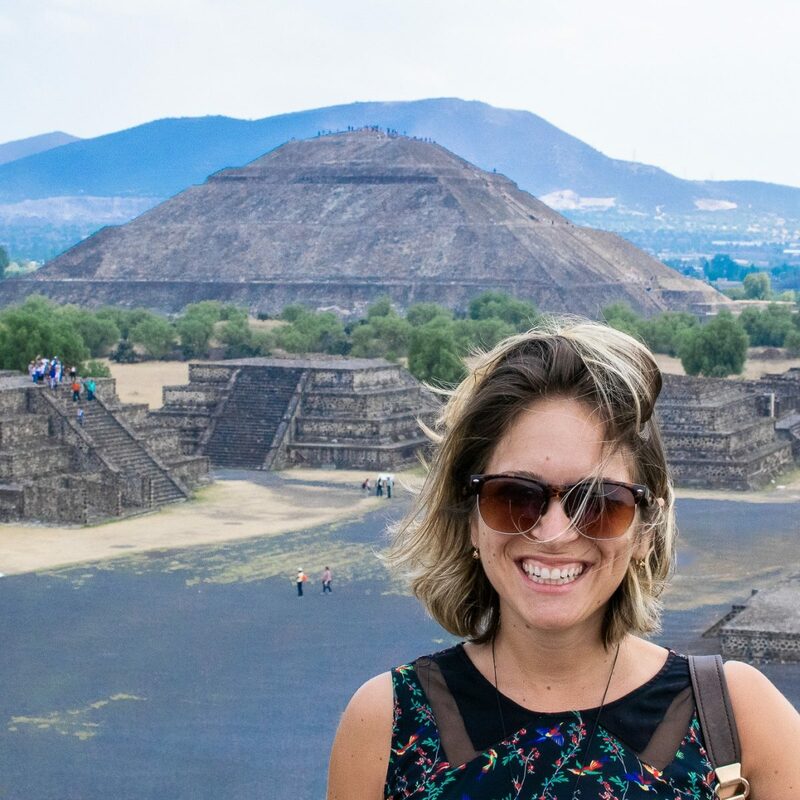 I know that a lot of people come to this blog to learn more about life in Mexico City, whether that’s because you’re traveling to Mexico or you’re considering moving here yourself. There will be stories, current events, recent restaurant finds, and different photos from around the city that I often don’t get a chance to share anywhere other than Instagram stories. This month I revisited a place that I went waaay back when I first arrived in Mexico City. It’s called El Rey de Suadero in Polanco. As you might have already guessed, they make a seriously good suadero taco. Suadero comes from either a cow or a pig and is made of the part of the animal between the belly and the leg. It’s slightly fatty, but when it’s slow cooked like it is here, the flavor is absolutely outrageously good. I also recommend trying their Birria. 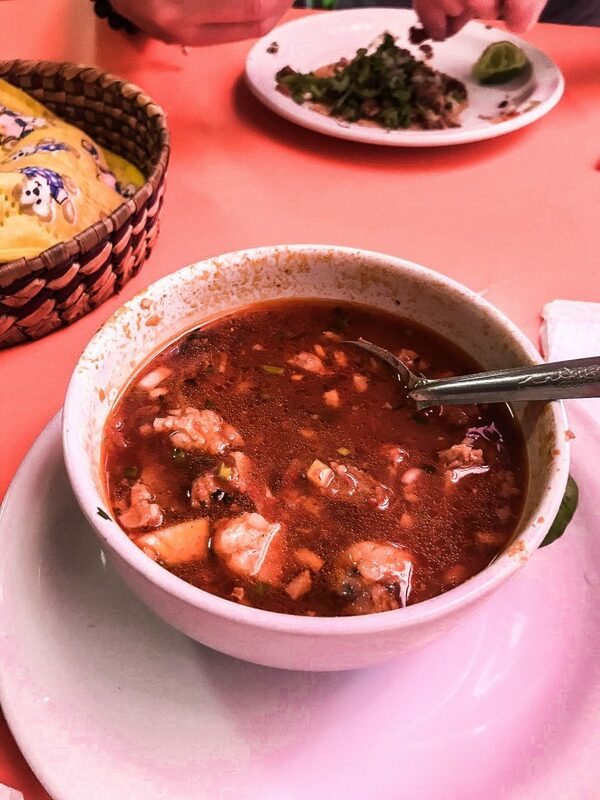 It comes in a sort of thick broth and is served with tortillas which you can either fill with the birria meat or you can use just to dip into the luxurious broth. It’s some of the best birria I’ve ever had. It’s a super casual family-style restaurant with probably about 10 or 15 tables, so at the busy lunchtime rush, you may have to wait a few minutes for a table. I couldn’t help digging into this well before I remembered to take a photo. Another seriously good find was Taco Mio inside the Tianguis near Plaza Villa de Madrid. The market runs down El Oro on Saturdays and Sundays. Walk through the alley to the right until you pass the juice stand. Then you’ll get to the food area. From here, I believe Taco Mio is the second restaurant – you should see a neon sign on the wall with the name. Order the mixiote tacos. 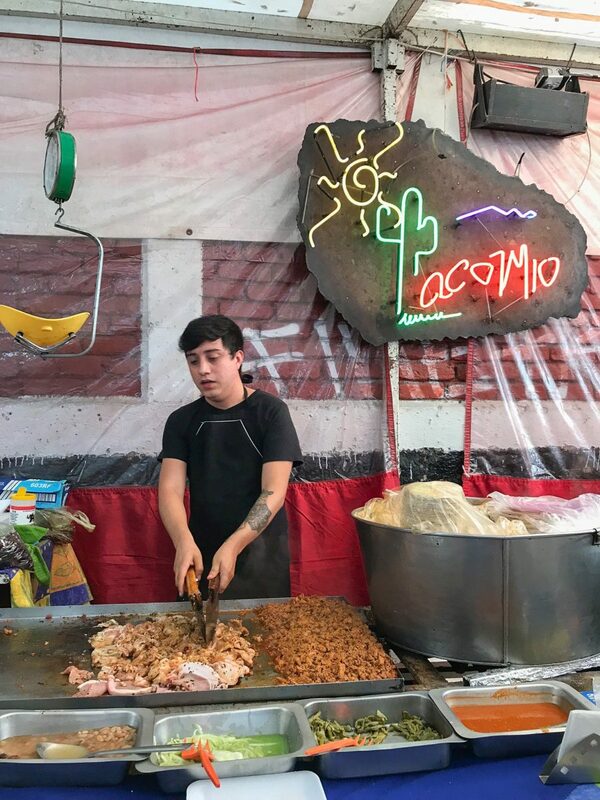 They are absolutely some of the best tacos I’ve had in Mexico. Top it with some lime juice, salsa, and habanero onions. They cook this meat wrapped in maguey leaves for days over in Hidalgo and then bring it over to the city on weekends so that you can enjoy them. 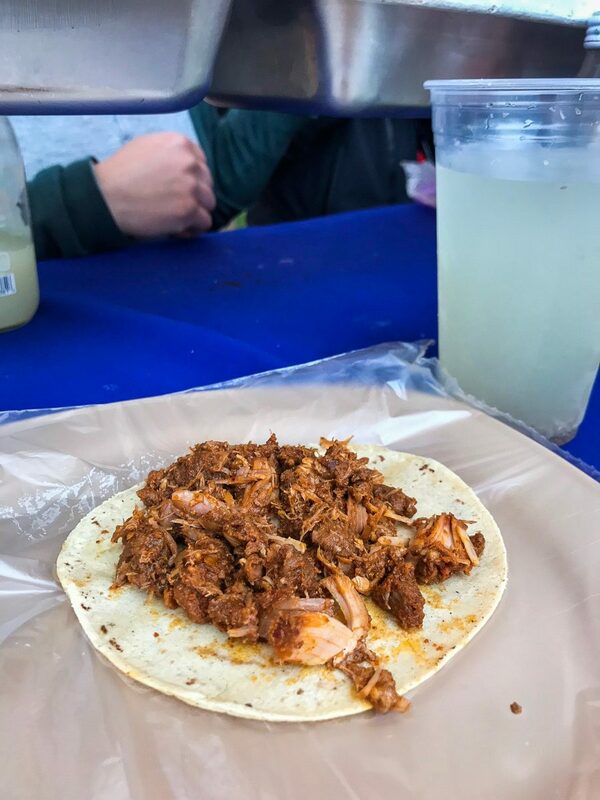 This is said taco – it is seriously one of the most delicious things on this planet. We also tried a new brunch spot recently called Chilpa. 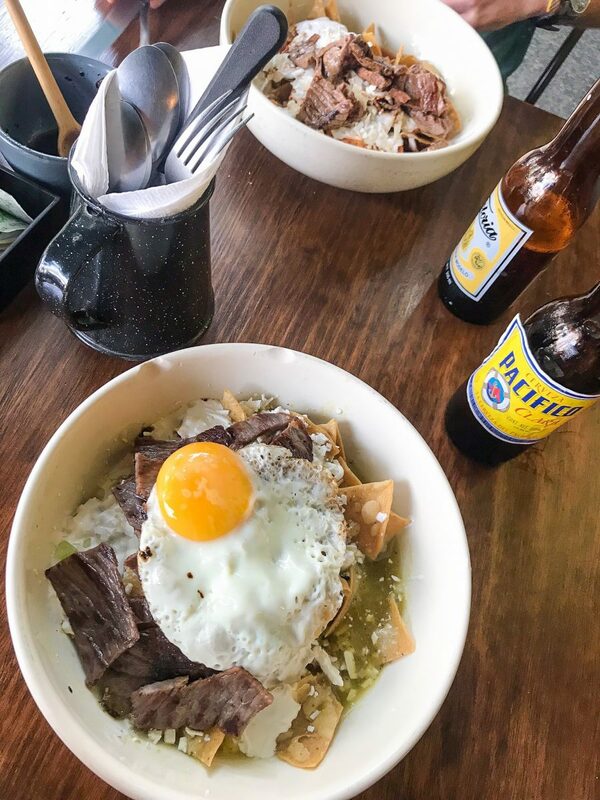 They’re known best for their chilaquiles which I can now confirm are absolutely delicious. I HIGHLY recommend the 5 chiles sauce with the chips topped with either cecina or arrachera. Both were outstanding but that sauce is truly something special. I’ve been working with a few tour companies around Mexico City this month and I’m having SO MUCH FUN exploring the city as a tourist again. It’s funny, when you live somewhere for a while, you start seeing it through the same eyes, even though there’s still so much that’s new to you. This month I took a bike tour with Bikes & Munchies and it was so much fun. I was a little bit nervous about bike riding around the city, but it was actually way easier than I thought it would be. I think I might start biking around the city more often now. It included some seriously great food stops including an introduction to the above mentioned mixiote taco from Taco Mio. 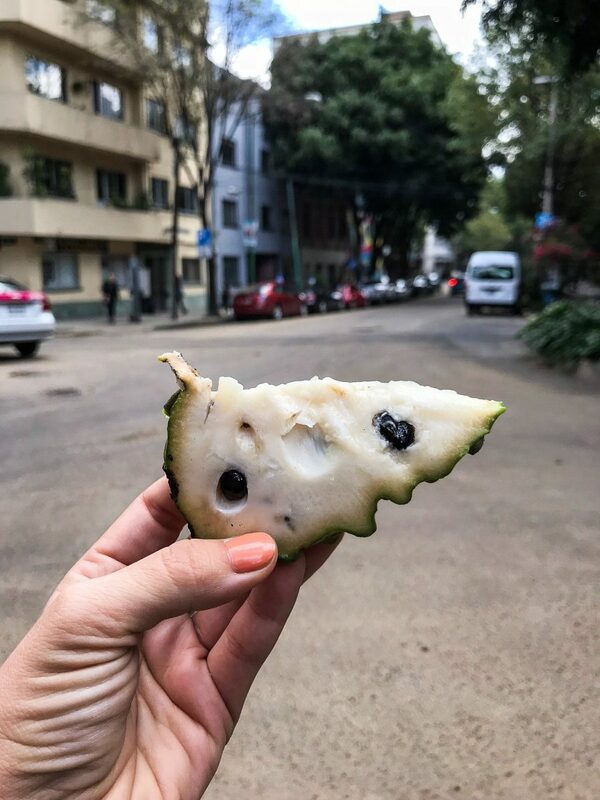 I also took a food tour with Frutas y Verduras. This was completely different but just as fascinating. I learned so much about native Mexican produce and tried some that I’ve been eyeing up at my local market, but haven’t been brave enough to try. If you’re new to the city or you simply want to have a true foodie experience, I highly recommend taking a tour with these guys. This the tasty Chirimoya that I’ve seen a million times at markets but have never tried. It was SO delicious and creamy. The Mexico City Reader by Ruben Gallo: I only just started reading this book, so I don’t have a full review for you just yet. But so far, I’m really enjoying it. There aren’t a ton of books in English about life in Mexico City and this is a really interesting peak. It’s actually a collection of essays from both Mexicans and foreigners who have called Mexico City home. The book was put together back in 2000, so a ton has changed since then, but it’s still a pretty interesting look into Mexico City’s past. Get a copy of The Mexico City Reader here. Flights by Olga Tokarczuk: This is a beautiful collection of short stories about life on the road, about movement, about travel and what home is. It’s so beautifully written and there were so many points throughout the book that I was underlining things and laughing out loud. Get a copy of Flights here. I’m back to writing about Mexico again after a summer of European travel (although I still have a few Italy posts up my sleeve). There were also some other great posts written by fellow bloggers across the internets about Mexico that I think you’ll probably find helpful. I’m so excited about the next few months. I think this is going to be the longest amount of time that I’ve stayed in Mexico since I moved here over two years ago and I am really happy about that. While I’ve really enjoyed all of the international travel I’ve done this year, I’m pumped for short-haul flights and lots of new-to-me Mexican foods. I’m making plans to explore Guadalajara, Puerto Vallarta, and perhaps San Luis Potosi over the next six months. Stay tuned!